Muddy says: Winner of The Good Pub Guide County Dining Pub 2018, The Three Chimneys not only offers top quality food and service, it’s also located in one of the prettiest spots I know. 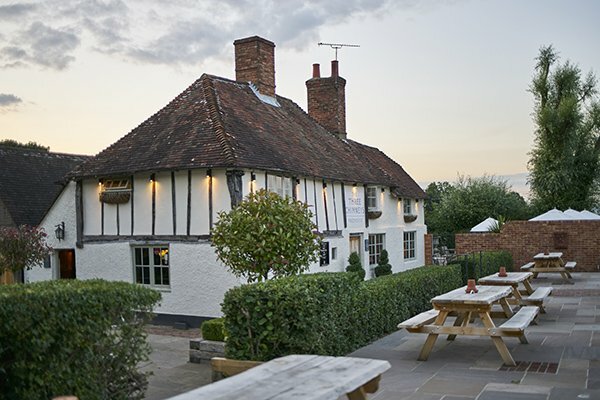 A well-deserved winner of The Good Pub Guide County Dining Pub for 2018, The Three Chimneys at Biddenden is a beautiful old building, surrounded by exceptional scenery and steeped in local history. Once you step through the front door, dark oak beams, aged hops and a roaring fire in the winter greet you, creating an atmosphere of warmth and relaxation. This pub pretty much typifies everything you would expect from a traditional Kentish pub and much more. The aim is to offer the best informal dining experience in a truly unique location. The kitchen uses local produce where possible and the food has an outstanding reputation. With five different dining areas, there is a place for everyone to eat, from the distant traveler to the country rambler. There’s a great garden space which is overlooked from the terrace, a main main restaurant or lots of hidden nooks and crannies in the characterful pub. There’s also several recently finished rooms in a separate building across the pub gardens – giving added peace and privacy – with views directly onto open countryside and sliding doors. With loads of character and charm each room is furnished to a high standard and radiates a traditional and unique character with a modern twist.